I’m John Laviolette, also known as “Talysman the Ur-Beatle”. 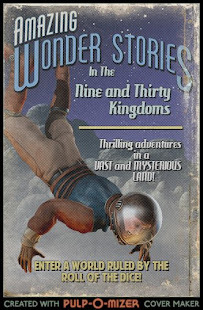 The Nine and Thirty Kingdoms has been a brainstorming, testing, and feedback point for my old school fantasy role-playing game ideas, as well as an occasional stage for my rants. My primary interest is Original Dungeons & Dragons, in particular the first three booklets. That’s right: I play with the original d6 hit dice for everyone, all weapons do 1d6 damage, low or no bonuses for ability scores, no spells higher than 6th level except as scrolls. I focus on the original three classes + a modified version of the thief, but I’m lenient with additional classes as long as they are mostly just mods of the original classes, with about the same number of abilities. I have some material for download here, and will be adding more. If you need to contact me about something else, this page is open for comments. I will delete spam, though. One of your posts disappeared, the June 2013 post on Skeletal Undead. Do you have a back up that you can put up? It's going to be available in a download, eventually. What happened to the subhex material? But it looks like it must have been relabeled or removed. If the former, my Google-fu is failing me. If the latter, is there any way to still get access to it? Probably removed, in which case I'll eventually edit/reformat and bundle up in a PDF. If you really need it, I can get to it in a couple days. I have a back-up on a computer that isn't connected to the internet yet. In the meantime, the stuff under the wilderness label should hold you over. Cool. It's specifically the subhex stuff I'm longing for. I'll keep an eye on this page, do you think you could throw up a pointer whenever you put it back up somewhere? Thanks! Here's the blog post on the release of Subhex Wilderness Crawls in PDF.